The Association intends to place agroecology high on the European agenda of sustainable development of farming and food systems. It intends to foster interactions between actors in science, practice and social movements, by facilitating knowledge sharing and action. It aims at the creation of an inclusive European community of professionals, practitioners and citizens engaged in agroecology. Agroecology Europe: Vassilis Gkisakis (TEI of Crete, GR), Paolo Bàrberi (Scuola Superiore Sant’Anna, Pisa, IT), Stéphane Bellon (INRA SAD, FR), Paola Migliorini (University of Gastronomic Science, IFOAM AgriBioMediterraneo, IT), Alain Peeters (RHEA, BE), Alexander Wezel (ISARA, FR, DE). From other institutes & organisations: Emmanouil Kabourakis (TEI of Crete. 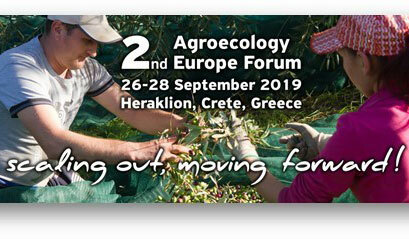 GR), Emmanouil Nikolakakis (Natural History Museum of Crete/University of Crete, GR), Sara Schneider (Misereor, DE), Constantinos Machairas & Charikleia Minotou (AgriBioMediterraneo, GR), Christina Vakali (Aegilops, GR), Panayotis Papadopoulos (Agroecology Greece, GR) and others to be confirmed.